Hi. 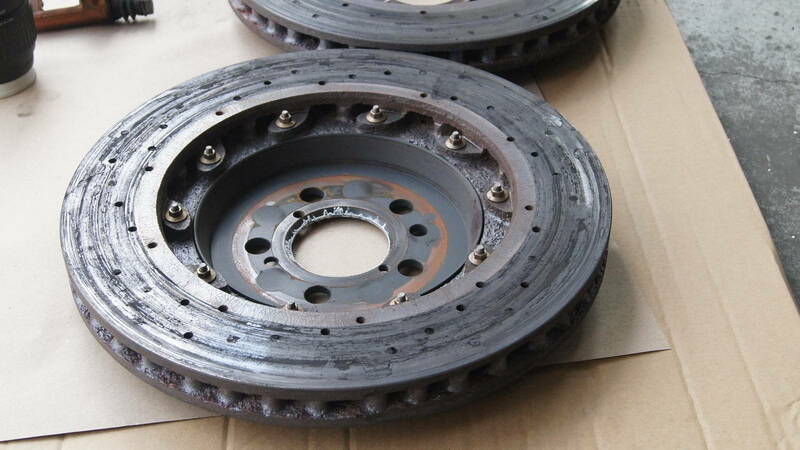 I would like to show you how ceramic brakes look like after two visits on track. Rear brake sensor has failed so rear pads melted and badly damaged rotors. 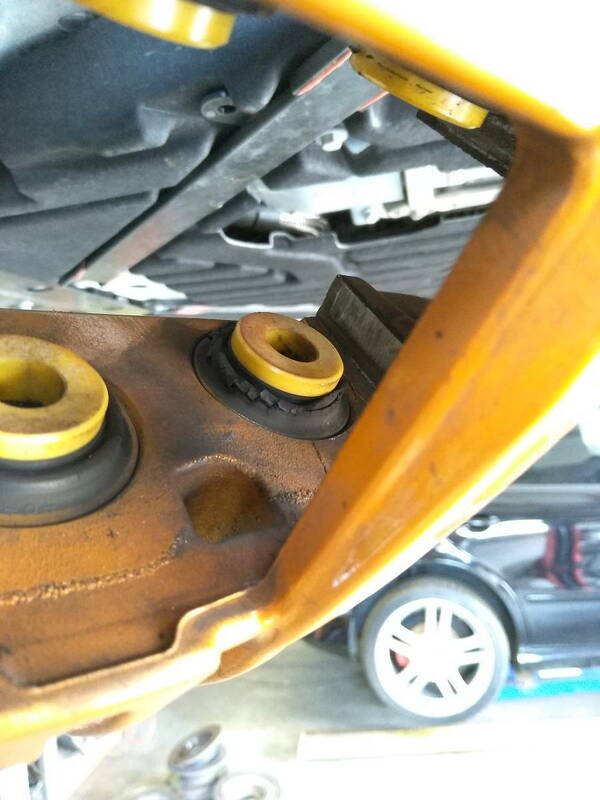 Boots and seals in calipers melted. Fronts does not look much better... Shields cracked due high temparature and also damaged rotors. 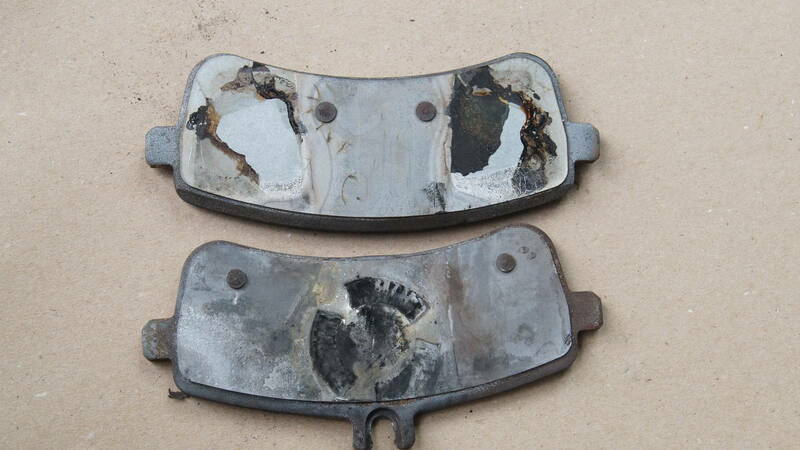 Car does not have ventilation for brakes plus material is not durable enough and this what happens with them. Sensors are from A class etc. very simple and cheap ones. Even for BMW Ms are much better made. I'm not first who has issue with brakes. Same situation happened to at least two gtrs i know. I saw on my own eyes on track when it happened. 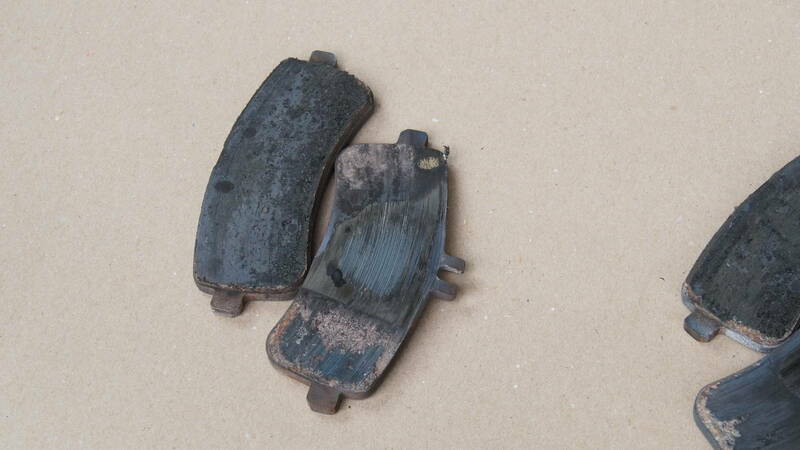 Guy used same brake pads as i did. I hired an independed well respected expert and he has shown that brake sensors are not adequate to this model and temparatures are too high for them. Not only for sensors. 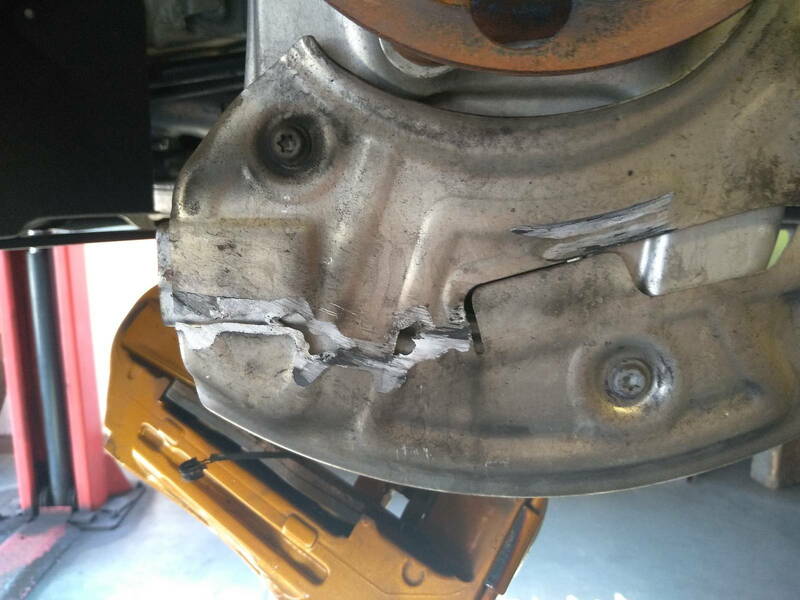 Brakes are not designed properly for this car. 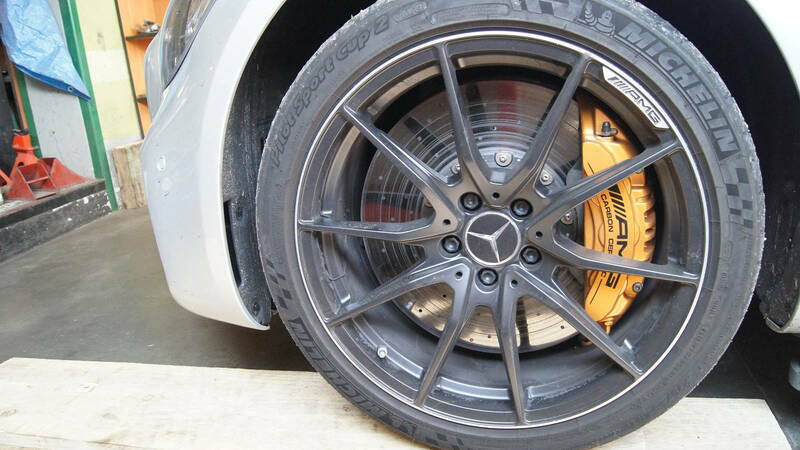 Funny thing is that Mercedes AMG recommends to use black series brake pads from SLS or SL for track use. Of course i changded pads to black series one right after brake procedure. I knew that brakes are not the strongest part of AMG GT so i was doing only 2-3 fast laps then 2 cooling and drive to pit to save brakes etc. Yet brakes has failured only after maybe 10-12 laps. 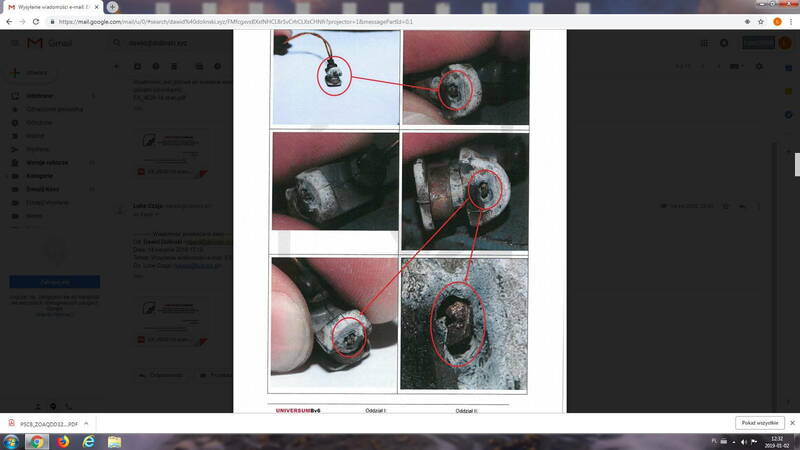 Mercedes refuses to change my brakes with warranty, cause they say that car was used on track :rolf: Can you believe it ? :rolleyes: First Mercedes advertised as a track tool, as a GT3 rival. Every brochure, every Mercedes web page shows this car in track habitat :D Even it has track package as an option... 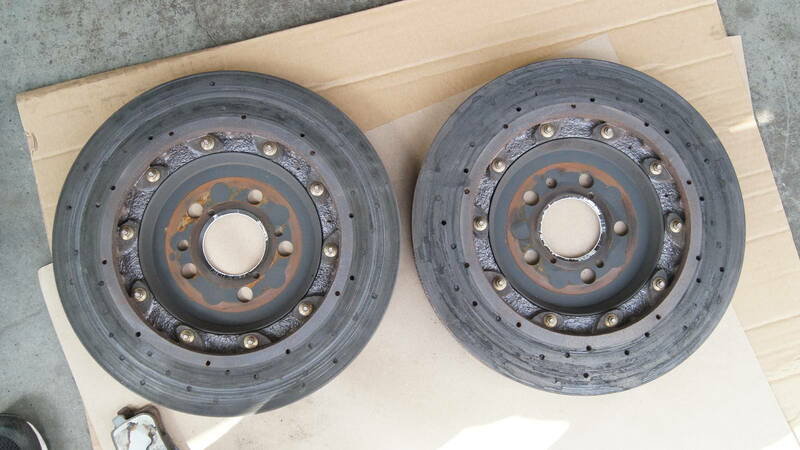 Ceramic brakes are advertised as for track use. 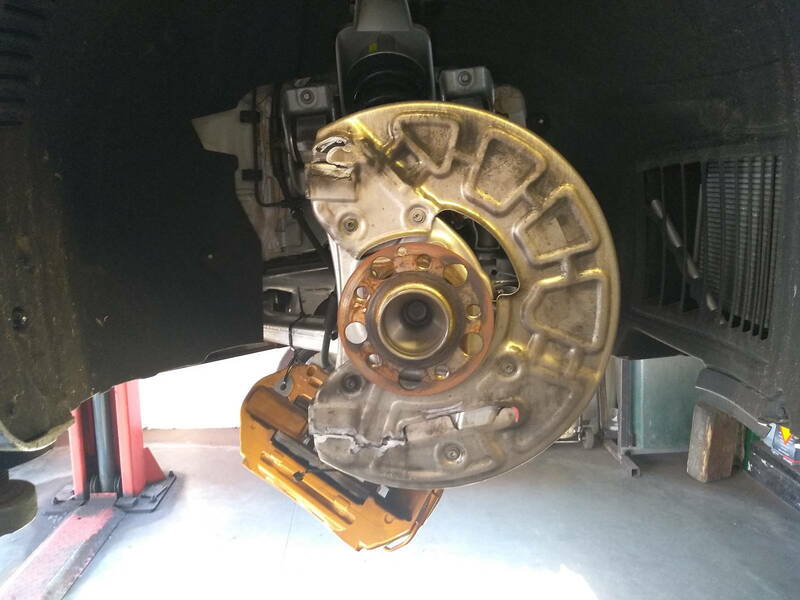 I was driving Porsche cars, M cars on tracks and have never ever had problems with brakes like that, not to mention if something was broken not a single problem with warranty. So be aware. Stock pads are good only for two laps then same situation happens. 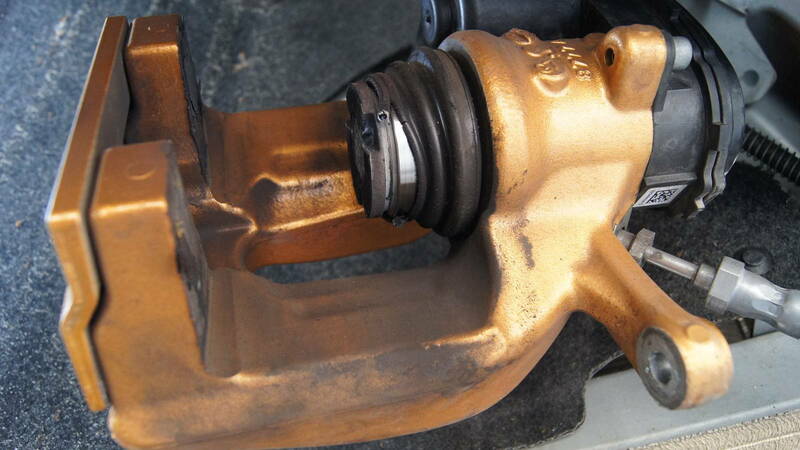 Rear sensor does not show any signs of wear and you notice that brakes are finished when you do not have brake power to stop the car. It can be dangerous. Did you go off track and pick up dirt/gravel at any time ? 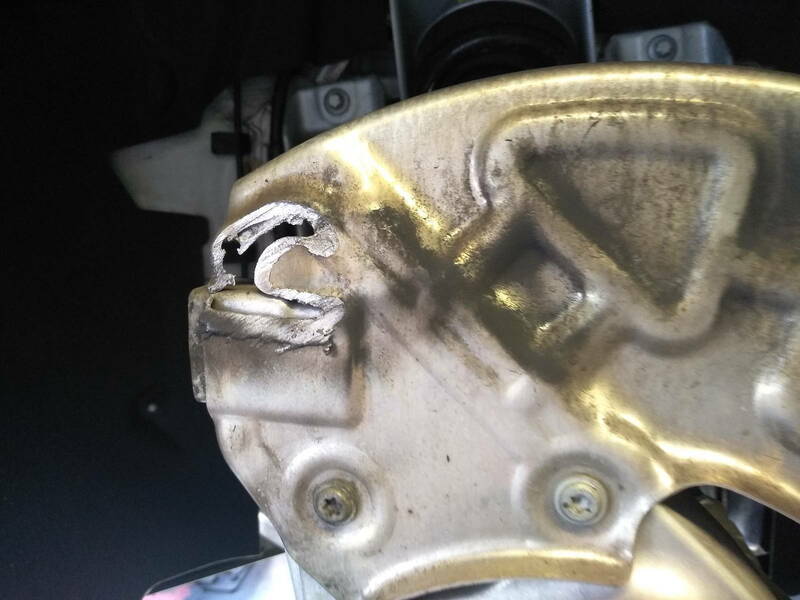 I agree completely that the brakes on this car are not very good and they're not adequate for the car BUT what you describe doesn't match the pictures, the heat shields have been abraded/damaged not "cracked due to high temperature" which implies that something was caught between them and the disc causing damage. The brakes on the car will do a decent job if you look after them and don't use them at 100% (stupid I know). I can get 3-4 days out of a set of pads on mine while turning in decent quality laptimes. All the best with the warranty but I would not expect full coverage from any brand on that sort of damage. Sorry to hear of this issue for you. As WhiteBlack states it certainly looks as if something other than just excess heat may have contributed to the brake issues. I have been very fortunate to have excellent results with my CCMs. 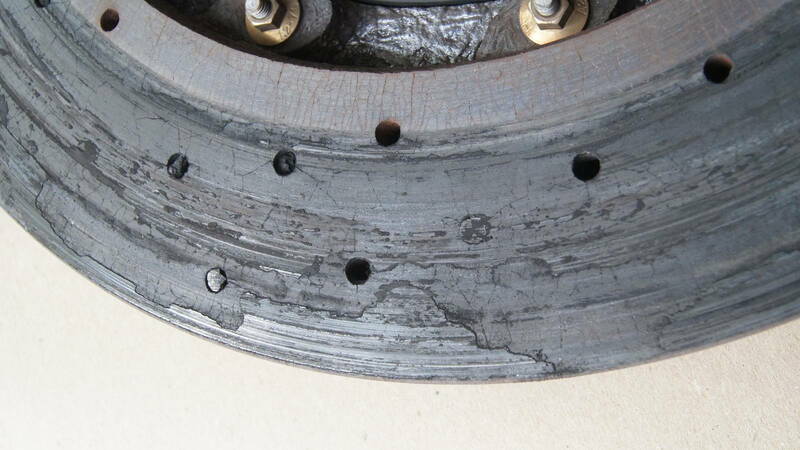 I burnished the pads prior to track use; run with ESC Off, and have always experienced fantastic braking on track. My OEM front pads are still in excellent shape, but I will be replacing my rear pads next Spring as they are down to 1/3rd thickness; this from my son driving the car in ESC ‘Sport’ mode. All of the above with about 22-24 average HPDE run sessions on the car btw. Of course not !! Im not novice when i go on track :) Never went off. I bought it especially for track using and i only drive with it on trailer. Believe me that the heat is a factor to front shields. Nothing has ever felt down between rotors and them etc. 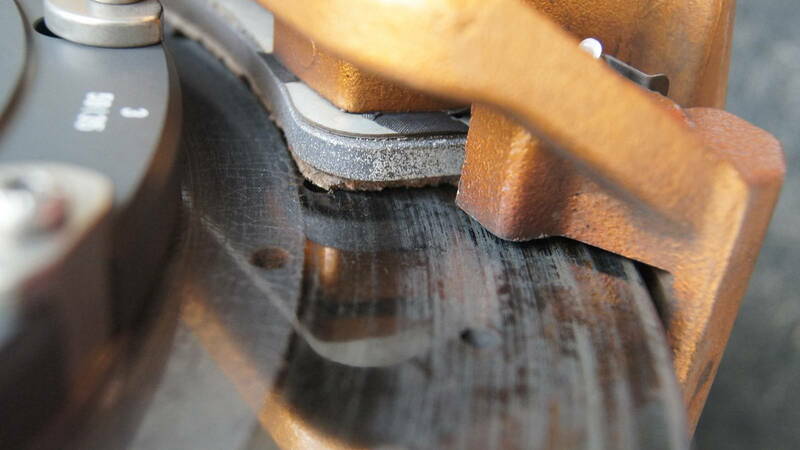 Due temperature the surface changes in size and they damage front rotors too. Also like i mentioned before i was awared that brakes are not Porsche ones and thats why i only drive 2 fast laps then cool down. They are decent only for one lap. On second one you can fell through brake pedal that they are giving up. 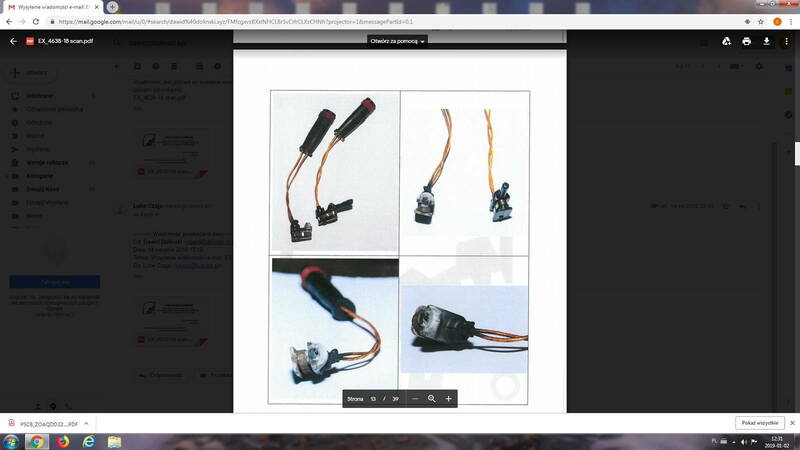 The main culprit is a sensor. Interior pads melted so how can you notice that they are gone ? Every GT has that problem. Problem is that Mercedes avoids responsibility with their poor design with their flagship model. They sell it as a car for track use as a Porsche alternative in every commercial etc. Pads are not designed for track use. They are too weak for this car. After this incident with black series pads and sensor failure i drove on few tracks with different setup and was ok. But still only for 2 hot laps. Maybe you drive moderate or maybe they changed something with pads. I did two hard sessions on the stickier ZP compound tires and I didn't have any issues, the pads still look good enough for another track weekend. OP, how many miles were on your car before you hit the track? I do not think anyone in my run group would say that I drive ‘moderately’! The pads are the OEM GT R pad version. From the second lap on after I have heat in the tyres I run each lap as fast as I’m comfortable doing; I’ve never had to back-off to cool the engine; the transmission or the brakes. What track(s) were you running on, and how was the car configured? I got the brakes on my GTR so hot that the paint on all 4 wheels cracked (MB did replace those!) so I’m definitely using them. youre saying that the heat shields expand and touch the discs? Not sure why you think the sensor is an issue? Seems irrelevant if you’re killing pads in 12 laps then something else is going on. re SLS Blackseries pads, I was told that these are the same as the regular GTR pads. 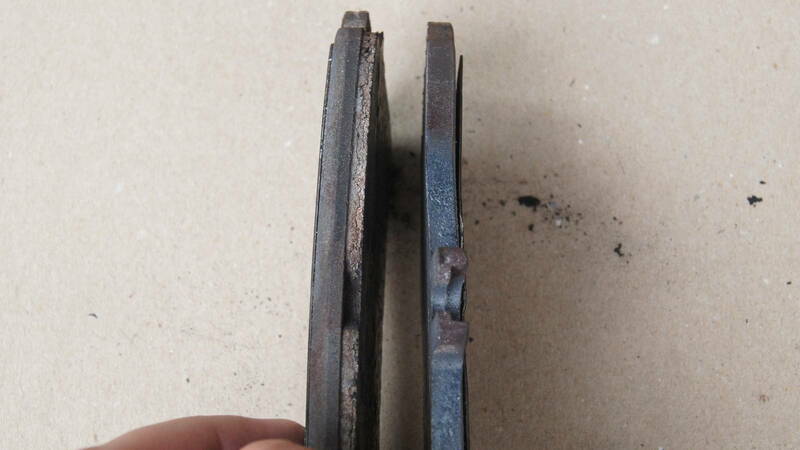 Same pads, 2 different part codes. My dealer orders me these as the GTR code always shows out of stock. I never tried to drive constantly like you do lap after lap. 3 laps are max in case if i do not have clean one... Silesia Ring, which is Porsche track and Poznan track when rear pads gone after 5 or 6 laps. Car was like from day i got it from a dealer. 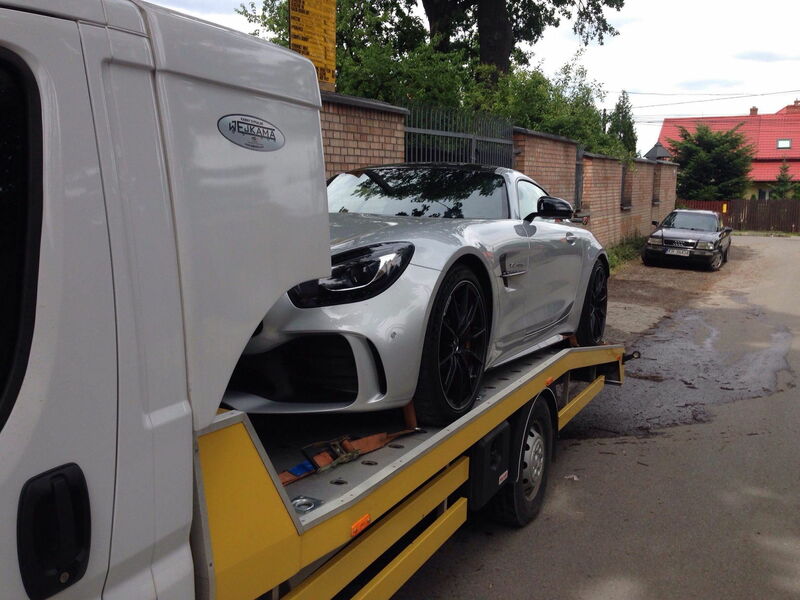 Well i got this recommendation from AMG driving academy. They use these pads in all GT cars. 007 420 91 20 or 000 420 35 02. Stock pads drifted on shelf. Still got them. Sensor is an issue cause it's not working. So how car can gives you info that brakes are coming to an end ? 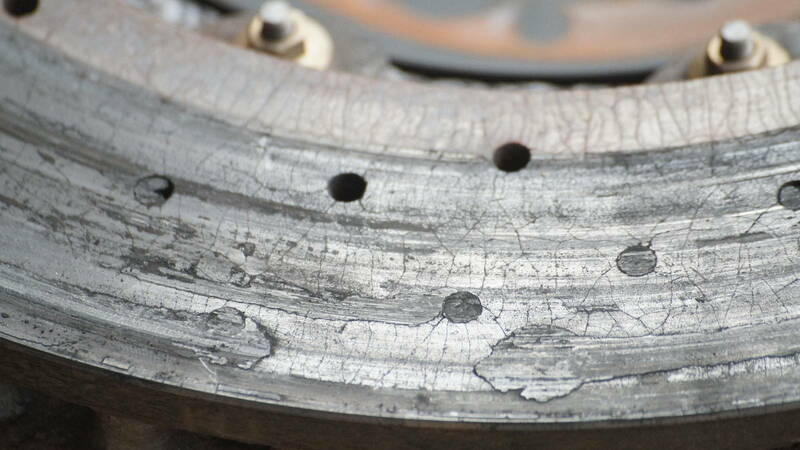 If i would got feedback from the car regarding pads i would not have ruined rotors like that. There was still a some material on front pads though, but like i wrote front shields touch rotors from inside and slowly damaging them. It's due heat for 100%. Nothing else. Pads are different. They are different in shape. You can tell that cause black series are cut on the corners. Very very simple solution imo. 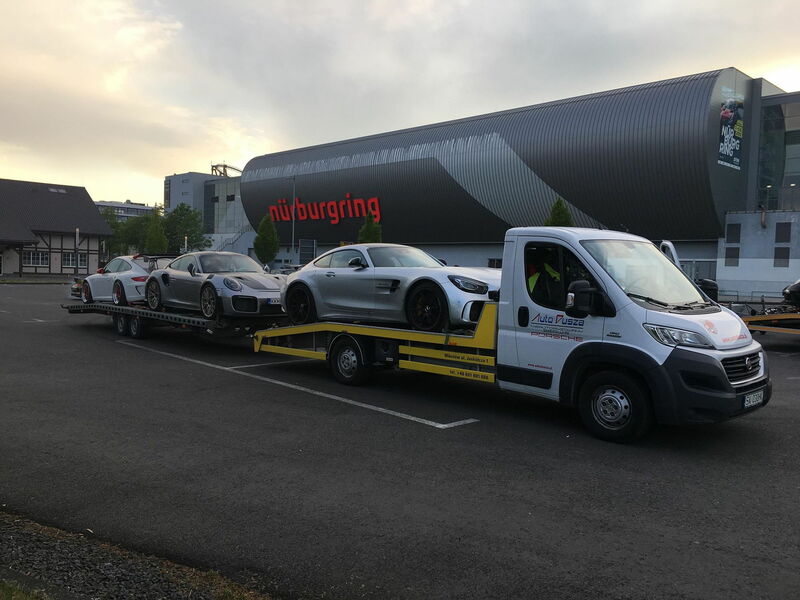 You need the special upgrade from the Renntech Nurburgring track record gtr. This will solve every issues you mentioned including cooling , better pads etc etc. Ya know the best drivers in the world spin out into the dirt / gravel and crash from time to time. What I see in those pictures is someone that doesn't have a clue about car maintenance before and after a track day or two. Driving lessons should be on your list along with new brakes. I was actually asking what mode you drive the car in on the track: Race? If so ESC fully on? eSC Sport? Or ESC Off? 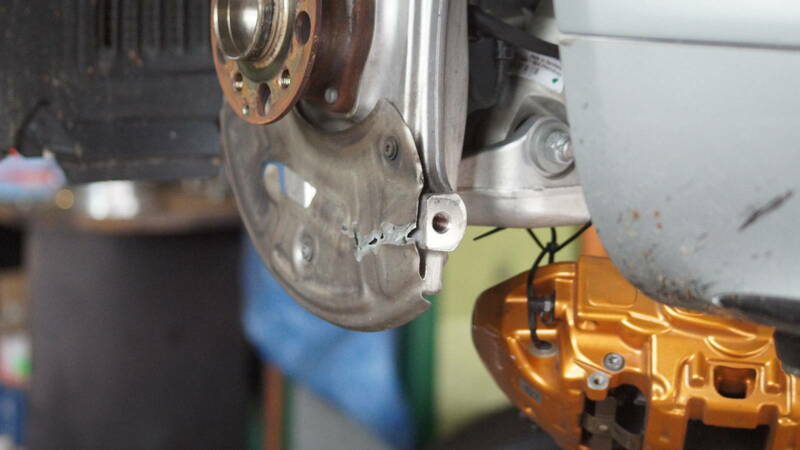 It makes a huge difference especially to the rear pads because if you drive with ESC active and if you aren’t a ‘smooth’ driver, the rear brakes are always trying to help ‘stabilise’ the car and wear quickly. Also, you have to condition (burnish) the pads with the CCMs if you want them to have better longevity and to perform at their best. Thank you for your consideration. Im glad you can tell from pictures how i can drive and how i maintenance my cars. Im impressed. I hope you can give me some additional clues when you see the video how i drive. I already spoke with Lukas about it. Maybe i will visit him next time when i be on ring. Thanks for tip.